Individuals involved in an accident that was reported to by a San Angelo Police Officer should obtain a copy of their official accident report, filed by the responding officer. A car accident report can prove to be very useful for the next steps one may wish to take following their accident. If an accident was not severe enough to warrant the filing of a car accident report and was not investigated by a police officer, individuals may elect to fill out a Blue Form for their own records. Information about doing so can be found here. If an accident was responded to by a Texas Peace Officer, then a copy of the Texas Police Officer’s Crash Report can be ordered through the Texas Department of Transportation (TxDOT). Information about doing so can be found on their website. Those looking to order a car accident report through the San Angelo Police Department have a few options for doing so, outlined below. We’ll get your San Angelo accident report for you. Just provide the details of your accident, and we’ll track down your San Angelo accident report and email it to you. 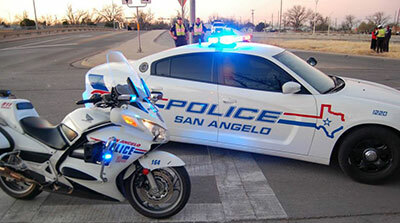 The San Angelo accident report can be ordered through LexisNexis Police Reports, an online database of police reports. In order for the database to locate the proper report, one must provide the state that the accident occurred in (Texas), the jurisdiction where the accident occurred (San Angelo), and one of the following: report number, OR last name of involved party and date of incident, OR last name of involved party and street where accident occurred. Once your report is located, you can order for a fee of $8.50, plus tax. The completed form should be mailed with a stamped, self-addressed envelope and a check or money order made out to the City of San Angelo. Reports ordered via this method cost $6 for an accident report, and $8 for a certified accident report. Finally, San Angelo car accident reports can be ordered in person by going to The San Angelo Police Department Records Division, located at 401 East Beauregard. The records division is open Monday through Friday from 8:00am to 4:30pm. They accept cash, check, or money order. Make sure to bring with you as many details of the accident as possible so they can locate your report.